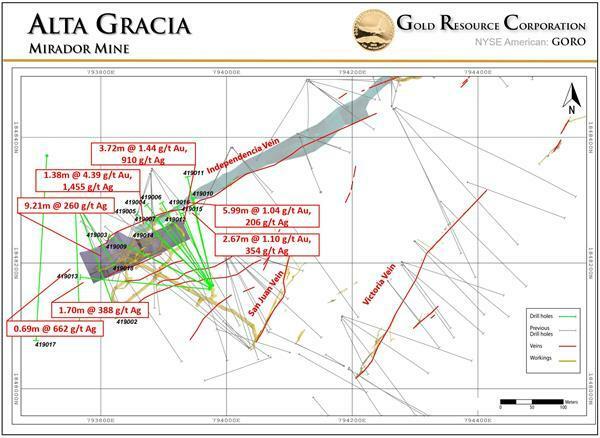 COLORADO SPRINGS, Colorado, March 26, 2019 (GLOBE NEWSWIRE) -- Gold Resource Corporation (NYSE American: GORO) (the �Company�) announced today its Nevada Mining Unit�s exploration plans include targeted expansion of the Isabella Pearl (IP) open pit deposit by testing the adjacent Civit Cat North. Additional nearby targets with open pit potential include �Scarlet�, where numerous high-grade surface samples are situated over historic drill intercepts including 70.1 meters of 1.02 grams per tonne (g/t) gold, and the �Civit Cat North West� target also along trend, where historic surface samples have reported grades as high as 9.70 g/t gold. Gold Resource Corporation is a gold and silver producer, developer and explorer with operations in Oaxaca, Mexico and Nevada, U.S.A. The Company has returned $111 million to its shareholders in monthly dividends since commercial production commenced July 1, 2010 and offers its shareholders the option to convert their cash dividends into physical gold and silver and take delivery. A modest 2018 drill program testing the boundaries of the IP deposit increased year-end reserves by 22,200 gold ounces and increased the deposit�s average gold grade by 2.7% to 2.28 g/t. Looking to build on the 2018 drill program success, Civit Cat North is the next target for potential IP pit expansion, which is the northern extension of the Civit Cat trend, located within the IP deposit�s northern boundary and currently hosting proven and probable reserves. Surface samples from the Civit Cat North target have reported grades as high as 2.1 g/t gold. Much of the early mine bench material in Civit Cat was estimated to be waste in the IP mine plan; however, a significant amount of this material to date has shown economic mineralization and has been delivered to the heap leach pad for future gold extraction. Topographic constraints around Civit Cat North have limited its historic exploration drilling. With the upper portions of the pit shell now removed from mining, there is better access to test the Civit Cat North target. If future drill programs define sufficient mineralization at Civit Cat North, a pit lay-back to the north would be analyzed to potentially expand the IP open pit. In addition to adding to the IP deposit, the Company targets nearby gold discoveries for additional open pit mining to the north west including the Scarlet and Civit Cat North West targets. Scarlet begins approximately 100 meters north west of the Isabella Pearl Project�s current planned pit boundary (see target map below). Although limited historic third-party drill data exists in this area, the results are encouraging. Gold Resource Corporation has also collected and assayed numerous surface samples at Scarlet with gold grades assaying as high as 9 g/t (see surface sample highlights table below). There is a consolidation of high-grade surface samples at Scarlet along the Pearl fault structure. At least three north west regional faults extend through the IP deposit, with geologic models suggesting mineralization hosted in both the Isabella and Pearl structures may extend north west through the Scarlet target area. The high-grade surface samples are situated above and near the three historic drill holes at Scarlet, including 70.1 meters of 1.03 g/t gold starting at 128 meters down hole. Depending on the dip of this mineralization, these drill holes could represent the extensions at depth of the high-grade mineralization sampled at surface. In addition, the IP deposit is being mined from the top of two peaks to access a higher-grade core at depth. Scarlet has a lower elevation, as it sits deeper in the valley at the base of the mountains. In other words, the elevation of the IP deposit�s high-grade core is closer to the surface elevation at Scarlet. Because of this proximity to surface the overburden/waste rock at Scarlet could be much less. The high-grade surface and historic drill intercepts make Scarlet a priority target, indicating that it could be the next minable deposit discovered at the Isabella Pearl Project. Initial exploration efforts are planned to focus on the south eastern portion of the Scarlet target, which lies within the current permitted IP mine plan of operations, potentially reducing the number of permitting requirements necessary to bring additional mineral resources into production. The initial Scarlet drill program has been defined and the Company plans to begin drilling this area once commercial production has been established at Isabella Pearl. The Company also plans an exploration program at the Civit Cat North West (CCNW) target, located along the same trend and faults as the Scarlet target and IP deposit. Located approximately 3,000 meters north west of the IP Project, CCNW was mined on a small scale historically producing approximately 2,300 ounces of gold from several disconnected areas including a 9-meter shaft, a 50-meter lower adit and 110-meters of upper adits and workings. Historic third-party rock chip assays ran as high as 9.70 g/t gold (see CCNW assays below). The Company plans to initiate the exploration drill permitting process at CCNW, with a goal of discovering another open pit gold deposit at the IP project. Scarlet target samples taken by Gold Resource Corporation and assays reported by Inspectorate America Corp., Sparks, Nevada, USA. Civit Cat North West Target samples are historic assays reported by previous operators.